Why don't your kayaks have rudders? 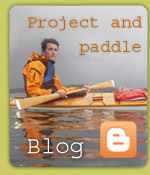 Most modern kayaks have rudders to help keep them on course and to steer. A canvas kayak can easily be steered with body weight and paddle, and the kayaks we build here stay on course by themselves, so rudders are unnecessary. Personally, I consider rudders to be not only unnecessary but also unsafe. They can easily be damaged or foul up rescues. In strong winds, a skeg is better for keeping the kayak on course than a rudder. I have occasionally mounted rudders on canvas kayaks when the customer has requested it. It's possible, but I advise against it.